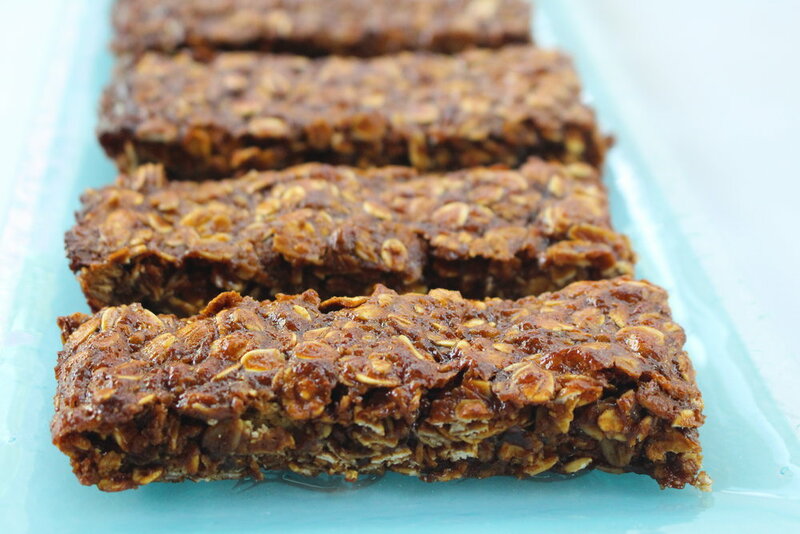 Try to make your own granola bars and you'll keep making them again and again! You are going to be in control of what you put into your body. No more processed and unhealthy food! Keep control of the amount of sugar and sodium in your food. In just a few steps and only 20-25 minutes in the oven, it can't get easier and quicker than this. Be creative! Use your favorite nuts, dry fruits, chocolate, or spices. A great on-the-go snack that your kids will enjoy eating. Store them in the fridge in individual bags for easy consumption. In a sauce pan on low heat, add almond butter, date syrup, maple syrup, cinnamon, and coconut oil. whisk together until combined. In a large mixing bowl add the oats. Pour the sauce over the oats and coat very well. Add the chopped chocolate and keep mixing until well distributed. Take a baking sheet and line with parchment paper. Pour the mixture on the baking sheet. Wet your hands and press the mixture evenly and tightly. Bake for about 15-20 minutes, until the edges starts to get golden brown. Let it cool, cut, and store in an individual snack size ziplock bags.